From the start, the sixth film in the Mission Impossible franchise put the pedal to the metal. Tom Cruise’s likeability and reputation for dangerous stunts are in full display in this action extravaganza. The shootouts, explosions, running and speeding cars that are expected in a movie like this are delivered amazingly. However, this time “Fallout” comes with a level of depth and visual flair that elevates its suspense to new levels. The plot of “Fallout” closely follows the events of its predecessor, “Mission Impossible: Rogue Nation”. The main villain from that movie (Solomon Lane, secret agent turned terrorist leader) returns with a large beard to serve as the criminal mastermind in this film. A failed operation by Tom Cruise’s Ethan Hunt and his Impossible Missions Force results in them losing nuclear material that, if in the wrong hands, would produce catastrophic fallout. The CIA sends August Walker (played adequately by Superman Henry Cavill with a thick moustache) to assist Ethan. The chase to find the nuclear material spans multiple continents and involves numerous characters. In fact, many actors from the previous films return (Rebecca Ferguson as Ilsa Faust, Alec Baldwin as Hunley, Michelle Monaghan as Julia Hunt, Simon Pegg as Benji, etcetera). What does “Fallout” do so well? For one thing, it has some amazing visual gags. The rubber mask disguises lead to some wonderful surprises that you won’t see coming. The story is full of plot twists and gotcha moments. Even the shortest dialogue sequences rapidly change in tone and meaning as conspiracies and betrayals are revealed. “Mission Impossible: Fallout” is very good at duping the audience and I took delight as double-crossings and secret plans were unveiled with glee. There are some solid jokes mostly involving Simon Pegg’s character, Benji, who is one of Ethan’s team members. However, for every moment of lightness, there’s double the amount of pulse-pounding suspense. “Fallout” has some unconventional but rewarding action sequences. A motorcycle chase turns into a car chase, then a pursuit on foot in a tense twenty-minute sequence in France. The helicopter sequence promised in the trailers is every bit as exciting as you might think. The punches and kicks are much more brutal than stylish, which makes the action all the more intense. 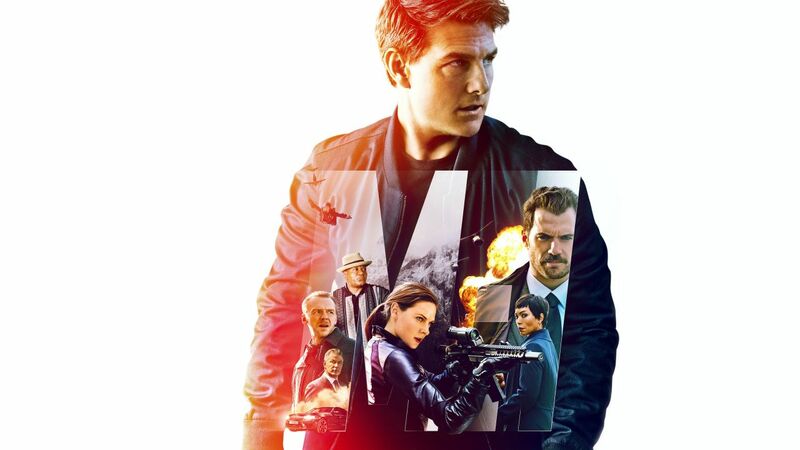 It’s typical for a “Mission Impossible” film to raise the stakes by putting its characters in danger, but the climax of “Fallout” raises the bar. The pacing suffers slightly, causing the film to drag a little, but it’s easy to breeze through its two and a half hour runtime without feeling bored. In short, “Mission Impossible: Fallout” is a cinematic experience that deserves to be seen in theaters. The fantastic fights, stunts and chases are bolstered by a good story that doesn’t let down on the twists. Overall, “Fallout” is a delight to watch.